Just as the world waited anxiously to find out which five children had found Willy Wonka’s golden tickets, the gaming world has huddled around their family radios for months eagerly awaiting official word on the five games in The Jackbox Party Pack 2. Like Augustus Gloop, Quiplash XL is absolutely stuffed to the brim. It’s got everything in the original megahit Quiplash game, plus everything in the DLC “Quip Pack 1,” PLUS tons of brand new prompts. Bidiots is an excitingly competitive auction game + hilarious drawing game all rolled into one. You’re at an art auction. You draw some pieces AND you bid on other player’s drawings. You’re given secret information on the value of certain pieces, but not all of them. It’s up to you to win the drawings that will bring you the most profit! 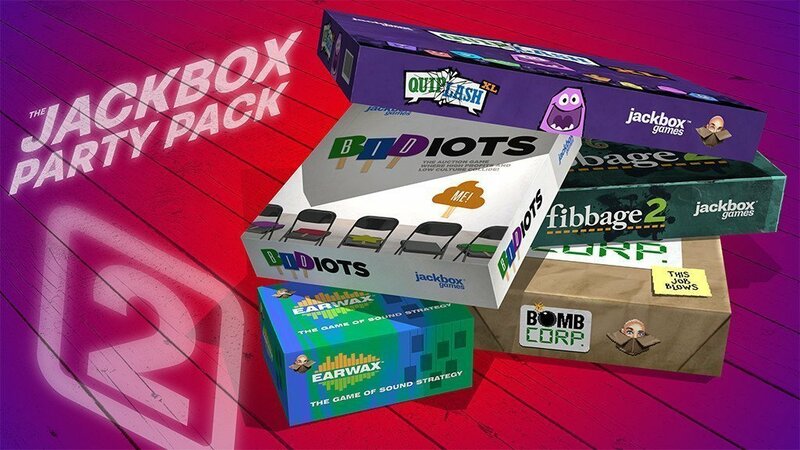 Packaged together at the ridiculously low price of $24.99, how can you afford NOT to buy The Jackbox Party Pack 2 for your next game night, party, or family gathering? What are you waiting for? Oh, yeah, you’re waiting for the release date. That’d be OCTOBER 13!!! That’s like, a week from Tuesday! Just show up outside the gates of our game factory on October 13 and wait for a strange man in a top hat to appear with further instructions. Or find it on Xbox One, PS4, PS3, Steam, Amazon Fire TV, or Google Play. Either-or. Good day. We said GOOD DAY!